Culottes are not a new trend by any means, but we have seen a surge in popularity in them over the past few months. I’ve personally been addicted to them all season long – remember these orange striped culottes, or these black and white striped culottes? … yeah, full on culotte addict over here! So I figured this would be a great outfit to showcase how to wear culottes to work. What I like about culottes is that they provide a ‘fashion forward’ vibe while still looking professional. The looser fit works for a more reserved, professional setting and is especially ideal for summer since the looser fit/wide-leg shape are great to beat the summer heat. If there is one thing you add to your wear-to-work wardrobe this summer, make it a pair (or two) of culottes. Enough about culottes generally; let’s talk specifically about these camel ones. 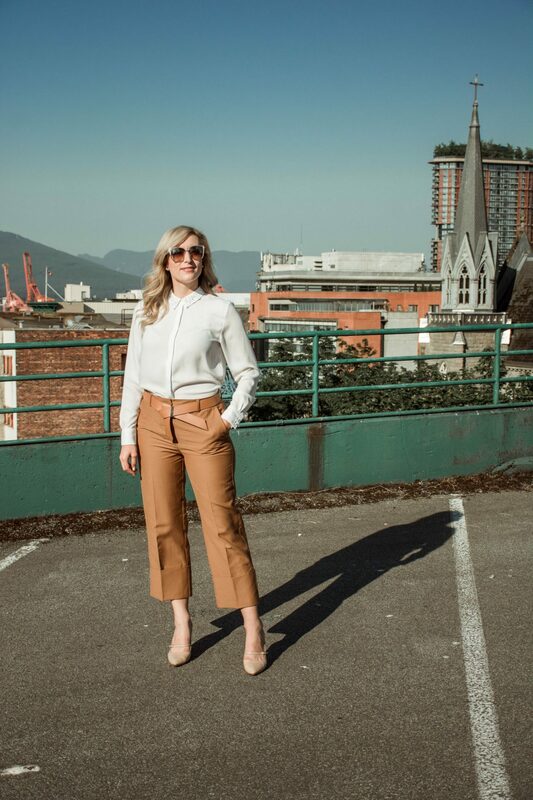 Camel shades are often reserved for fall (… and for the record I am definitely going to be wearing these into fall as well – picture them with a green & navy plaid shirt… *swoon*) but camel can also be a great color for wear-to-work pieces for summer. When you’re sick of wearing black & navy to work, opting for a combination of camel and white is a great way to lighten up for summer. And when you add culottes in to that color combination … work day fashion perfection! 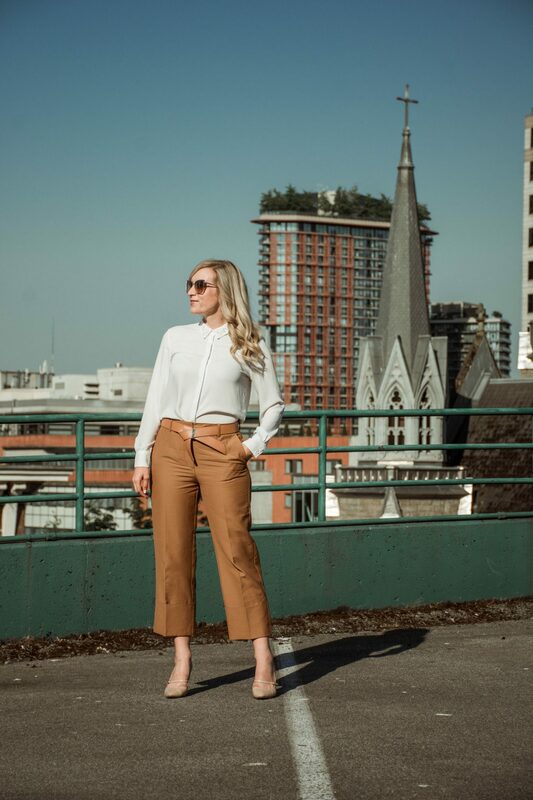 My exact camel culottes are sold out (why does that ALWAYS happen right before I share a blog post?!) but I’ve found two similar camel pairs that I’ll share below. As far as how to wear culottes to work, let’s talk about the rest of this outfit. Given the wide leg structure of culottes, I like to opt for a looser more flowy top. This pearl embellished collar button down is another staple in my wear-to-work wardrobe. It’s an old one from H&M, so I’ve linked up two similar shirts (white button down’s with pearl collars) in the widget below! My sunglasses are from DIFF eyewear – I love any chance to wear a brand that stands for something or gives back to a good cause. DIFF donates a pair of glasses to someone in need for every pair of sunglasses sold. On a completely unrelated note – what do you guys think about these pictures?! My photographer Austin (she is amazing) picked this location and developed this sort of 1970’s vibe. I really like this retro vibe for this particular outfit and I basically felt like I was in Vancouver in the 1970’s while shooting. Such a fun experience. "Great Skin with Delta Laser"
I love culottes and I definitely think they are perfect for work. They just elevate your workwear outfit and make it more chic! I love this camel colored one! That’s exactly how I feel – they can elevate a classic work look into one that is chic! I am loving all of these photos! It goes SO well with your whole outfit, so good. Culottes are some of my favorite pants and I’m obsessing over the color of these. And so many ways they can be dressed up or down. Aw thank you SO much Lydia! Austin is such a creative photographer – I love working with her. And yasss culottes really are the best right! This is a great outfit for work! Love those pants! This is such a chic work outfit and I love the style of these culottes! Thank you so much Kim! The dramatic cuffs on the culottes are one of my favorite things about them. This an outfit perfect for work! Also love the photos! 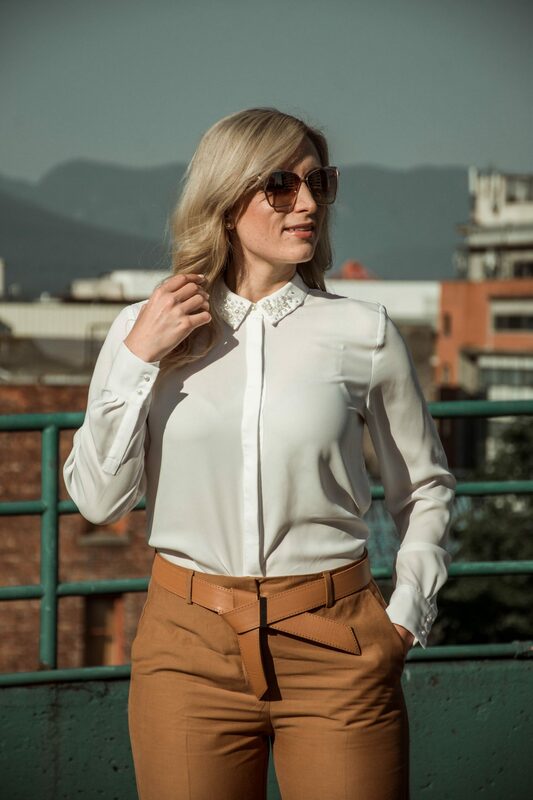 A great work outfit, chic and elegant at the same time! Love this chic office wear look! All the shades of tan are so amazing together. I’ve been living in culottes lately. I would totally wear this to work and then for drinks after! Ahh I’m glad Im not the only one obsessed with them lately! And I love that! Any look that can take you from the office to after work dinner / drinks is my kinda outfit! In love with this belt!!! I feel like it happens to a lot of us, things sell out before we can share them! Thanks girl! It’s a really really old one or I would have shared it. And ugh, it’s the worst when that happens eh! I’m glad Im not the only one it happens to though! I don’t know if I could pull off culottes because I’m so short- but you’re rocking this work look! Aw thank you so much! The key is finding ones that fit your frame- I actually find they can be good to elongate your legs if you’re shorter if you wear them with heels (and again find ones that fit well) I’d recommend ASOS for petite culottes; they have a ton! That belt is SO chic and really making the whole look come together. I love it! I don’t work in an office but if I did I would totally be recreating this look! I know it’s a small detail but I love this belt! Love this look! The culottes almost look like leather! Thank you! And yes they are super interesting! !